Snoqualmie Valley Hospital (SVH) provides convenient care to people who are on blood-thinning medications or who require blood work. You must be registered with SVH. Please call 425-831-2379 for an appointment. Appointments required. The older you are, the more likely you are to have high blood pressure. Our local Eastside Fire & Rescue perform blood pressure checks weekly unless they have been called to an emergency. Call Adrian Walsh of Priority Footware at 206-708-0927 to see if you qualify for shoes and custom inserts under your Medicare/Medicaid plan. He offers on-site fitting & delivery. Affordable teeth and denture cleaning is provided by Healthy Smiles, Inc. Cleaning is priced below what you would expect to pay at a dentist’s office. Call Healthy Smiles at 206-650-3272 to make an appointment. Appointments are required. Call Mt. 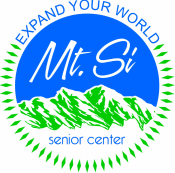 Si Senior Center at 425-888-3434 (ext. 0) to make an appointment. Our longtime footcare nurse, Chriss Egan, retired in May. We are actively searching for a replacement. Please check in with us to hear updates on our progress. Highly trained volunteers will assess your needs and pinpoint the most helpful information and assistance. The Snoqualmie Valley Support Group for Stroke and other Neurological Diagnoses meets monthly at Snoqualmie Valley Hospital. Contact Kris 425-831-2376. Home Equipment Loan Program (HELP) Need Home Care Medical Equipment? Equipment is repaired and sanitized by Bridge Disability Ministries and available for re-use. Used equipment can be dropped off at Mt. Si Senior Center or Sno-Valley Senior Center. Contact Susan Lord at the HELP Center at 425-831-3754 or susanl@snoqualmiehospital.org. Old Friends Club Welcoming Friends. Enriching Lives. The Club meets 2 to 3 days each week for guided conversation and activities in a small group of adults. Members may have memory loss, Alzheimer’s or other cognitive or communication challenges but the focus is on strengths, friendship and fun. The Club is welcoming new friends in Carnation. Seattle Humane Society provides services to keep people and pets together in King County. Low-income senior citizens can receive a supplemental supply of pet food. We want to ensure that frail community members never have to choose between feeding themselves and feeding their pets. Seattle Humane Society's Pet Food Bank collects pet food donations for the pets of seniors and low-income community members, and the Pet Food Bank feeds more than 1,500 pets in need every month with donated pet food that is delivered to local senior centers.